"The Sakuteiki", or "Records of Garden Making," was written nearly one thousand years ago. It is the oldest existing text on Japanese gardening - or any kind of gardening - in the world. 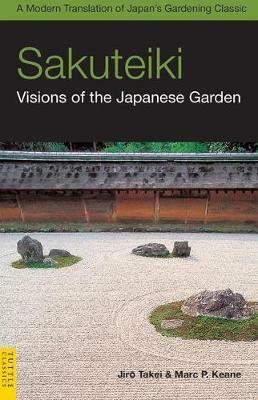 In this edition of the "Sakuteiki", the authors provide both an English-language translation of this classic work and an introduction to the cultural and historical context that led to the development of Japanese gardening. Jiro Takei, professor emeritus of the Kyoto College of Art, taught a course on the Sakuteiki for many years. Throughout his long and distinguished career, he has been deeply involved in the study of Japanese gardens, as the Chairman of the Japanese Garden Academic Society (Nihon Teien Gakkai), regional chief of the Gardening Academic Society (Zoen Gakkai), and chief researcher of the Research Center for Japanese Garden Art (Nihon Teien Kenkyu Senta). Marc P. Keane, a licensed landscape architect, and garden designer, came to Japan in 1985, and since then has been creating and building gardens for companies, temples, and private individuals. He teaches a design workshop as an adjunct professor at the Kyoto University of Art and Design and is a staff member of the Research Center for Japanese Garden Art there. He is also the Chairman of ISSK, International Society to Save Kyoto, a multi-national society working to preserve Kyoto's natural environment. He has traveled and lectured widely on traditional and classical approaches to Japanese garden design and landscaping. He lives in Kyoto where he owns a landscape architectural firm.